I recently had the opportunity to try a couple of fun (and stylish!) products from chicBuds (earphones with Swarovski Crystals). They offer some beautiful accessories. The chicBuds are retractable, decorative earphones to use however you receive your music: iPod, portable CD player or personal computer. 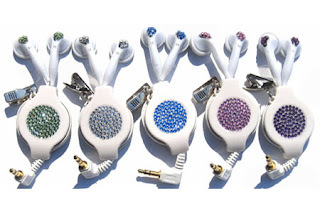 chicBuds are detailed with genuine Swarovski Crystals transforming which makes them not just functional, but fun! The chicBuds come in both black and white with five delicious flavors (or colors): Blueberry, Grape, Watermelon, Sour Apple and Marshmallow! There are some limited edition designs including crosses, hearts, and awareness ribbons, as well as RockBuds for the men in your life. chicBuds have a unique retractable feature that keep the cords from getting tangled. Make sure you read the How it Works page so you don't break them! The second item I tried was the Pink Tooth (other people call them "blue tooth") ear piece. As you can see, below, it is a beautiful piece. The ear piece came with 3 various sized tips to find the perfect fit in your ear. I am using the smallest one. There is also a black "hanger" that attaches to the the ear piece to give added security. Some people can get a secure fit with just the bud, but I needed a bit more. After a couple of days, my hanger broke, but chicBuds offers a 100% satisfaction guarantee, and my new hanger is on its way. The sound quality is great! In fact, my husband can hear me better on the Pink Tooth than when I call him using the phone! I've had some trouble getting used to the push button on the ear piece to receive calls. But I think I'd have trouble with any ear piece. It will just take some getting used to. I have one problem with the Pink Tooth, but most people won't encounter this. I wear hearing aids in both ears. And the Pink Tooth and the hearing aid don't both fit in my ear at the same time. There is a volumn control, but it is still a little quiet for me. I don't know of any blue tooth accessory that has extra loud controls. I've really enjoy using the Pink Tooth when I'm walking. I have music loaded on my smart phone. I put the ear piece in my ear and start walking. If I get a call, the music automatically pauses while I take my call. Both the chicBuds and the Pink Tooth retail for under $50. I have one set of chicBuds earphones to send to one reader. Leave a comment with your favorite product on chicBuds. I like the black sour apple chicbuds. Oh and the ipod covers are awesome! I don't have that shape ipod, though. I adore the white and watermelon chicbuds. They are so darling. Love the sour apple chicbuds! I"m definately goign to try for a blue tooth(OR PINK in your case). The watermelon chicBuds are awesome! I like the heart shape bud. Thanks. I have been trying to win a pair of these forever. I love the watermelon chic buds. I love these. I like the mens plaid rockbuds. How cool. I like the white chicBuds in marshmallow! I love the sleek look. Thanks for the giveaway! I love the Black Star Power chicBuds. Thanks for the chance to win! I'm subscribing via google reader. I like the Violet Love Buds. I follow you on twitter, revaskie. I like the white and watermelon. I just fell in love with the Pomegranate Purple Ipod case! That would perfect for me. I love the blue raspberry swirl in white! Thanks for a great giveaway! I love the black with grape chicbuds!